Bryan Lee O'Malley (born February 21, 1979) is a Canadian cartoonist, best known for the Scott Pilgrim series. He also performs as also a musician under the alias Kupek. Bryan Lee O'Malley attended St. Thomas Aquinas Catholic Secondary School in London, Ontario, Canada. He went on to start in Film Studies at the University of Western Ontario, but dropped out before completing. His first original graphic novel was Lost at Sea, released by Oni Press in 2003. Lost at Sea is a coming-of-age story about a shy 18-year-old girl named Raleigh, who believes her soul was stolen by a cat, and the road trip she takes across the United States with several teens from her school that she barely knows. From 2004 to 2010, O'Malley worked on the six-volume Scott Pilgrim series, published by Oni Press in digest size black and white books. The series was a critical and commercial success, spawning a full-color re-release, a 2010 film adaptation, Scott Pilgrim vs. the World, a video game adaptation, and a number of official soundtracks. O'Malley created the cover art work for the 2012 video game Fez. In July 2014, his graphic novel Seconds was released by Ballantine Books. In mid 2016, O'Malley revealed the title of his next major graphic novel Worst World, which currently has no release date. He is also the co-creator of the ongoing comic book Snotgirl with Leslie Hung. He is officially billed as its writer. O'Malley is half Korean and half French-Canadian. In 2004, O'Malley married fellow cartoonist Hope Larson. They lived together in Toronto in 2004, Halifax in 2005, North Carolina from 2008 to 2010, and Los Angeles. They divorced in 2014. O'Malley is also a songwriter and musician (as Kupek) andwas formerly in several short-lived Toronto bands such as Imperial Otter and Honey Dear. ^ a b c "National Post bio of O'Malley". Arts.nationalpost.com. Archived from the original on 2012-03-07. Retrieved 2012-03-20. ^ james-reaney. 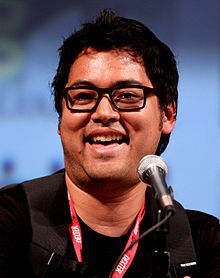 "Hail to STA grad: Scott Pilgrim's Bryan Lee O'Malley". Archived from the original on 2016-09-16. Retrieved 2016-08-28. ^ Franich, Darren (2010-07-02). "Entertainment Weekly article about the film's release". Popwatch.ew.com. Retrieved 2012-03-20. ^ McAlpin, Gordon (May 24, 2006). "An Interview with Bryan Lee O'Malley". Retrieved October 11, 2010. ^ "Why 'Scott Pilgrim' Creator Bryan Lee O'Malley's Future Protagonists Will Be Mixed Race". NBC News. Retrieved 2019-03-08. ^ "RADIOMARU.COM". RADIOMARU.COM. Retrieved 2019-03-08. ^ "The Comics Reporter". www.comicsreporter.com. Retrieved 2019-03-08. ^ Lee, Adrian (July 18, 2014). "Scott Pilgrim grows up". Retrieved August 28, 2014. ^ "2005 Harvey Award Nominees". Harveyawards.org. Archived from the original on 2012-02-27. Retrieved 2012-03-20. ^ "2005 Joe Shuster Award Winners". Joeshusterawards.com. Retrieved 2016-06-26. ^ "2006 Eisner Award Nominees". Comic-con.org. Archived from the original on 2006-06-14. Retrieved 2012-03-20. ^ "2006 Joe Shuster Award Winners". Joeshusterawards.com. 2009-09-30. Retrieved 2012-03-20. ^ a b "2007 Harvey Award Nominees". Harveyawards.org. Archived from the original on 2013-11-08. Retrieved 2012-03-20. ^ "2007 Joe Shuster Award Winners". Joeshusterawards.com. Retrieved 2016-06-26. ^ "NCS News". 29 June 2008. Archived from the original on 29 June 2008. Retrieved 17 April 2018. ^ "Past Winners - Doug Wright Awards". www.dougwrightawards.com. Retrieved 17 April 2018. ^ a b "2008 Harvey Award Nominees". Harveyawards.org. Archived from the original on 2013-11-08. Retrieved 2012-03-20. ^ "2008 Joe Shuster Award Winners". Joeshusterawards.com. Retrieved 2016-06-26. ^ "2010 Will Eisner Comic Industry Awards Winners". Comic-con.org. Archived from the original on 2010-11-14. Retrieved 2012-03-20. ^ "2010 Nominees and Winners". Joeshusterawards.com. Retrieved 2016-06-26. ^ a b "2011 Harvey Award Nominees". Harveyawards.org. Archived from the original on 2015-09-06. Retrieved 2012-03-20. ^ "2011 Nominees and Winners". Joeshusterawards.com. Retrieved 2016-06-26. ^ Heater, Brian (26 September 2015). "The 2015 Harvey Award Winners". Retrieved 17 April 2018. ^ "DC, Marvel & Fantagraphics Top 2014 Eisner Award Nominations". 22 April 2015. Retrieved 17 April 2018. ^ "2015 Nominees and Winners". Joeshusterawards.com. Retrieved 2016-06-26. ^ "Here's your sneak peek at the Scott Pilgrim creator's new comic". Retrieved December 21, 2013. ^ "'Scott Pilgrim' creator Bryan Lee O'Malley announces his next graphic novel, 'Worst World'". Retrieved 17 April 2018. ^ Vidani, Peter. "Chip Zdarsky". Chip Zdarsky. Retrieved 17 April 2018. ^ "EXCLUSIVE: Bryan Lee O'Malley's Cover To Sacrifice #5 - Bleeding Cool News And Rumors". 4 February 2013. Retrieved 17 April 2018. ^ "RADIOMARU.COM". Retrieved 17 April 2018. ^ "Oni Press • We're excited to finally reveal the Issue #1..." Retrieved 17 April 2018. ^ "BOOM! Studios debuts exclusive variant cover for new Valentine's Day comic". Retrieved 17 April 2018. ^ Perpetua, Matthew (2010-08-12). "Interview With Scott Pilgrim Creator Bryan Lee O'Malley!". Retrieved 2014-10-24. Wikimedia Commons has media related to Bryan Lee O'Malley. This page was last edited on 19 April 2019, at 13:09 (UTC).